Atoms for Peace featuring members of Radiohead and the Red Hot Chili Peppers is backing live streaming service Soundhalo. Re-live all the magic of Alt-J with the click of a button (and help of a credit card). Fresh after removing their catalog from Spotify, members of the musical super group Atoms for Peace, including Radiohead's Thom Yorke and producer Niles Godrich, appear to be putting their weight behind the Soundhalo music service. Atoms for Peace will stream two live shows on the fledgling platform on July 25 and 26. Soundhalo is hardly a direct competitor to Spotify, however. Whereas Spotify has built a dubiously successful business model built around streaming whole albums for free, Soundhalo offers videos of live performances for pay. Currently, the service--which has the tagline "Watch, download and share artist endorsed live music as it happens"--boasts a limited number of offerings. Right now, users have only two sets from indie-brit quartet Alt-J (whose Spotify page you can find here--heh) to choose from. 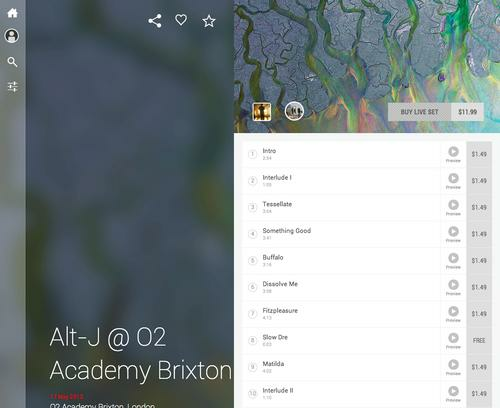 As for pricing, one of Alt-J's available performances at the O2 Academy Brixton in London, from May 17, is available for purchase for $12, or individual songs can be purchased for $1.50. Files can be downloaded as mp4s or "high res format" across all devices. Radiohead producer and AFP member Niles Godrich led the Twitter charge against Spotify three days ago, stating that "It's up to streaming providers to come back with a better way of supporting new music producers." In an interview with The Guardian today, Godrich spent less time attacking Spotify and more time boosting Soundhalo. "Part of the reason Soundhalo was interesting to me was that I found myself wondering why, whenever you go to a gig, the next day there are a million shaky, horrible sounding YouTube videos already online," he said. "But you go and look because you want to see something of your experience. Soundhalo provides something really functional -- an experience that you want to remember in front of you as soon as the concert has happened. To be able to relive that is a really great thing." Meanwhile, Red Hot Chili Peppers' bassist and AFP member, Flea has stayed out of the fray altogether.